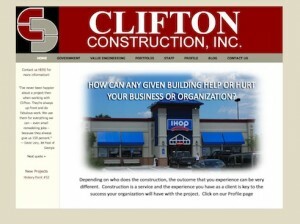 We were contacted in April 2008 by Clifton Construction Company, asking about a website; but one based on a particular design layout they had been working on. It took a few months to get the design implemented and working, and we have continued to update, finding new ways to help them conduct business in the CSRA, and beyond! This entry was posted in Websites and tagged augusta, clifton construction, construction company, csra, georgia, website on April 30, 2008 by David Stembridge.